Savoring life…one juicy bite at a time! A delicious way to eat your vegetables! I made this yummy dinner a few weeks ago and it was a big hit with my family. I knew I had to post it on Juicy Bites, but I was planning on making it again and taking some better pictures. I took these pictures with my iPhone instead of my new DSLR Camera that I recently got. When I made these, it was one of those nights where we were all starving and I just didn’t have the energy to figure out what the heck setting I was supposed to use in my dark dining room to make these damn lovely zucchinis look as delicious as they actually were. Don’t get me wrong…I love my new camera! I just need to make sure that I give myself plenty of time to take the blog pictures that I need and have plenty of patience. Something I DON’T have when I’m starving and my kids are whining for dinner. So why did I post it, you ask? Well, I was looking at pictures on my phone yesterday and saw the zucchini shots I had taken. Even though the lighting is not great, my “food styling” was rushed, and I used my phone…it still looked delicious to me and made me hungry just looking at it! I figured that it meant the pictures were good enough to share with my juicy readers. And if I wait, chances are I won’t remember how I made them! I usually cook dinner while my 9 year old, Max, is at the kitchen counter doing his homework. When I was scooping the center out of these zucchinis to get them ready to stuff, he looked up from his homework and scanned the counter to see what was on the menu for dinner. Max is a good eater and likes GOOD food. He’s never been picky and has pretty refined taste for a kid. When he saw the tomato sauce bubbling on the stove, the fresh mozzarella cubed up on the cutting board, and the big fresh bunch of basil…he smiled and said, “Wow. What’s for dinner? That’s all of my favorite stuff!”. I told him what I was making and he simply said, “YES!”. I found some giant organic zucchini at the market and thought they would be perfect to stuff. 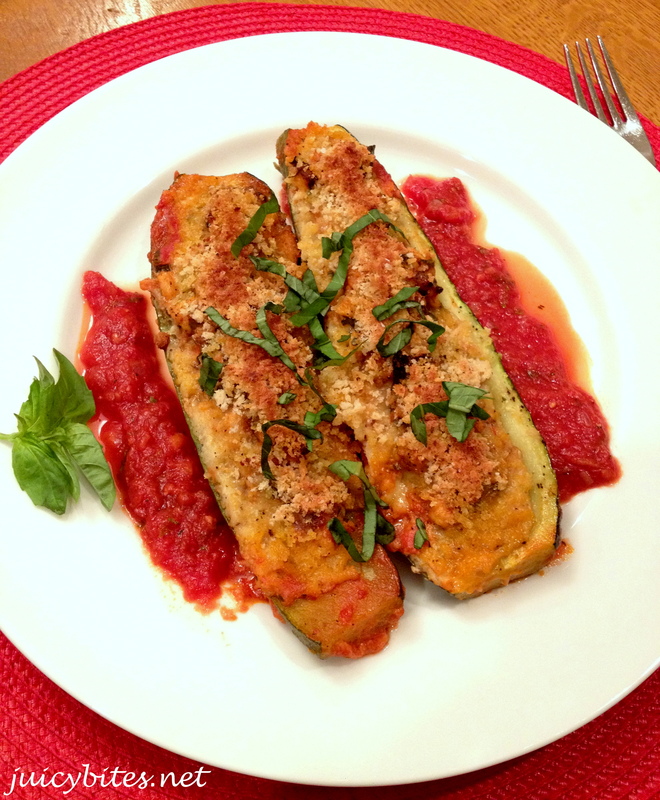 Normally, I prefer smaller zucchini, but for stuffing, these are perfect. A melon baller is a great tool to help you scoop out some of the flesh, but a teaspoon works well too. The filling was a simple combo of organic ground chicken that I cooked with some onion and garlic mixed with some fresh herbs and fresh mozzarella. 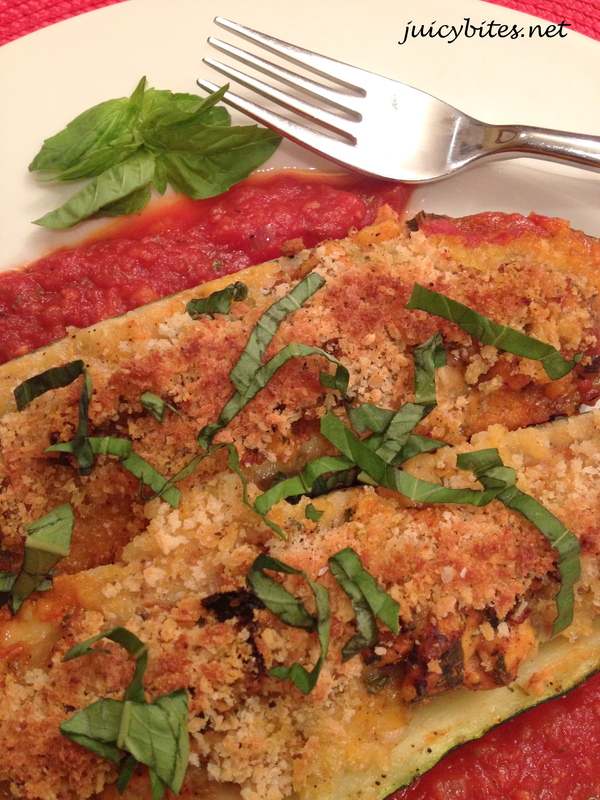 I topped them with some breadcrumbs, Parmesan, and a drizzle of olive oil for some crunch. Ground turkey or even ground beef would be great in these too. I may try ground beef with a little Italian sausage thrown in next time. I made a simple tomato sauce for these that you could use in a number of different recipes. I like to make a double batch and freeze some for later. It’s a great basic sauce and I use it for many things. If you are short on time, you can use a jarred sauce for this, but the home made makes such a difference!! You could serve this with some pasta (you will have plenty of left over sauce to put on it) or crusty bread, or keep it low carb and go with a salad. 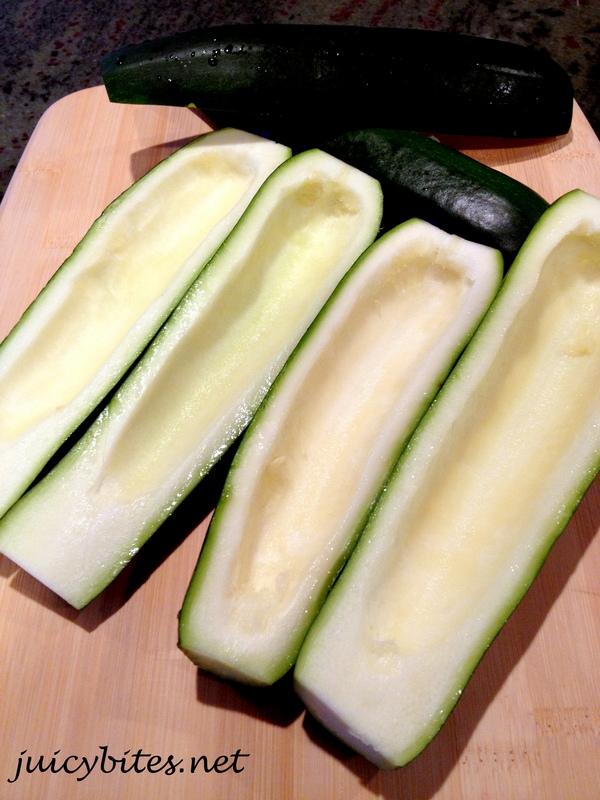 Prep your zucchinis by cutting them in half lengthwise and scooping out some of the flesh from the center of each half leaving about a 1/4 inch thick shell. Season the flesh side with a little salt and pepper. Coat a large pan with olive oil (about 3-4 tablespoons) and saute the onion until soft (10 minutes or so). Add the garlic and cook for another few minutes. Add the ground chicken to the pan, season with a teaspoon of salt and some pepper and cook until the chicken is completely cooked. Turn off the heat, add a cup of the tomato sauce to the chicken and mix well. Now is the time to taste for seasoning – add more salt and pepper if it needs it. Let the mixture cool, (you don’t want to scramble your eggs) then add the beaten eggs, the basil, the parsley and cubed mozzarella and mix well. Spray 2 large baking dishes with non-stick spray and add 1 1/2 cup of tomato sauce to each baking dish. Spoon some of the chicken mixture into each zucchini shell filling them nice and full so that the filling is rounded on top and place them on top of the sauce in a single layer. In a small bowl, mix together the bread crumbs and parmesan cheese with some salt and pepper. Sprinkle the mix onto the top of the zucchini’s and then drizzle them with olive oil (about 2 tablespoons or so). 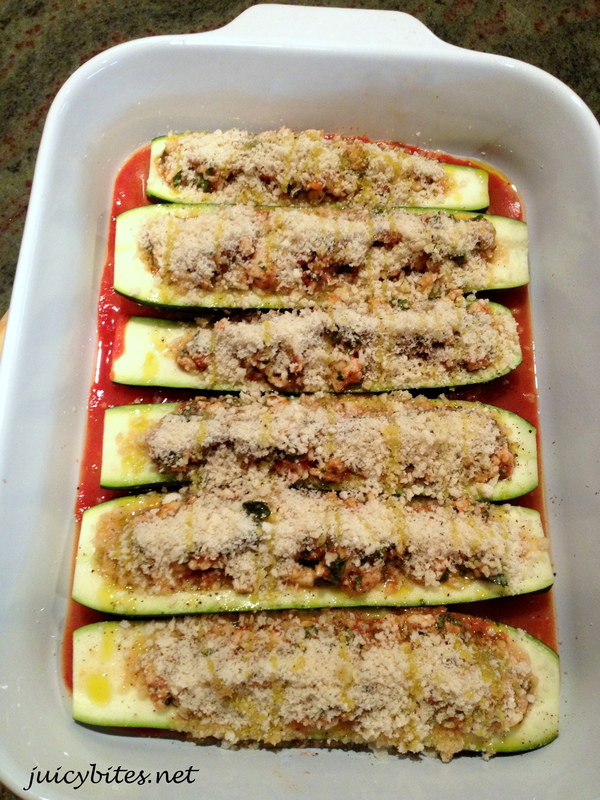 Bake uncovered for 25-30 minutes or until zucchinis are tender and the tops are golden. You may need a minute or two under the broiler to get the tops nice and golden. Serve garnished with fresh basil. **This is a great dish to serve for company because all of the work can be done in advance. Before adding the breadcrumbs and parmesan on top, you can cover your baking dishes with foil and refrigerate until you are ready to cook them. 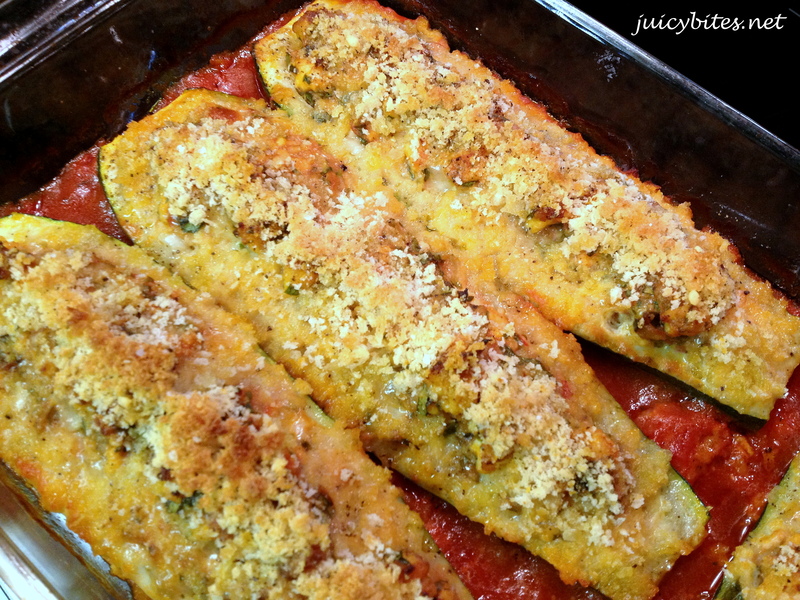 Just add the breadcrumbs/parmesan right before baking. You may need to add an extra 5 minutes or so to the cooking time. Tip: The tomatoes you use for this sauce will make a big impact on how it tastes. Imported Italian plum tomatoes are the best way to go. My favorites are Cento brand, especially their organic San Marzano variety. 1/2 cup of red wine (I like to use Zinfandel) – this is optional, but does add great flavor. In a 3-quart saucepan, heat the olive oil over medium heat. Add the onion and cook until soft and light golden brown, about 8 to 10 minutes. Add the thyme, carrot, and garlic, and cook 5 minutes more, until the carrot is quite soft. While you are cooking the veggies, use a blender or food processor to break up the tomatoes (don’t drain them) a bit. Just pulse them a few times, you don’t want them totally pureed. Add the tomatoes to the pan and the wine if you are using it, and bring to a boil, stirring often. Lower the heat and simmer uncovered for at least 30 minutes stirring occasionally. You want it to reduce and thicken. Season with salt and serve. This sauce holds 1 week in the refrigerator or up to 6 months in the freezer.